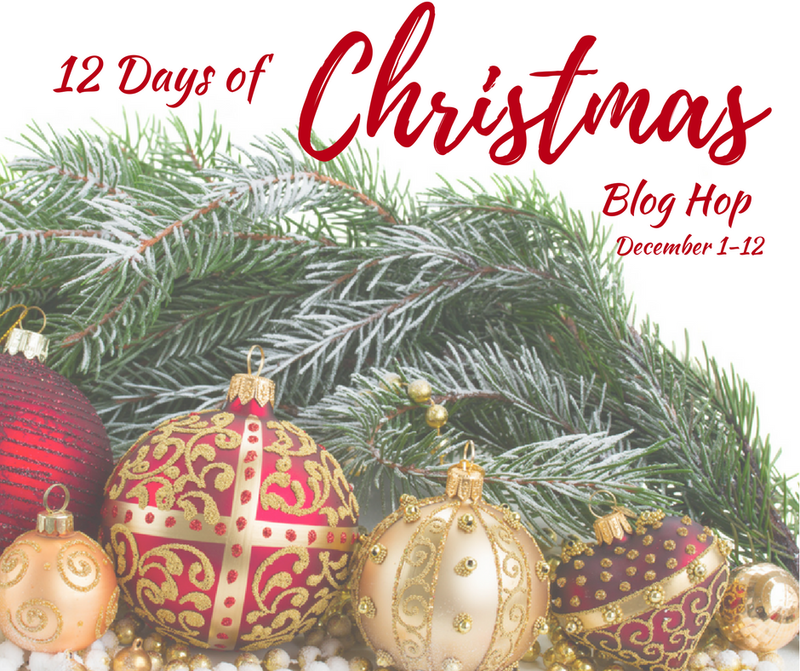 Welcome to the 9th day for the 12 Days of Christmas Blog Hop! 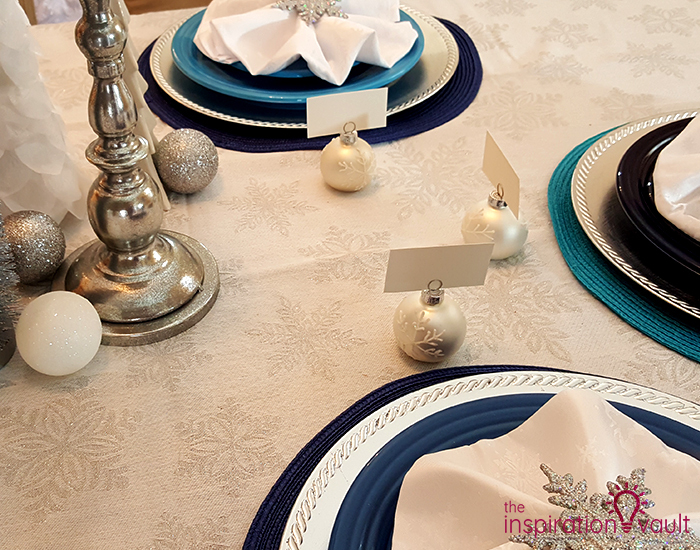 Today we’re all sharing our holiday table settings. 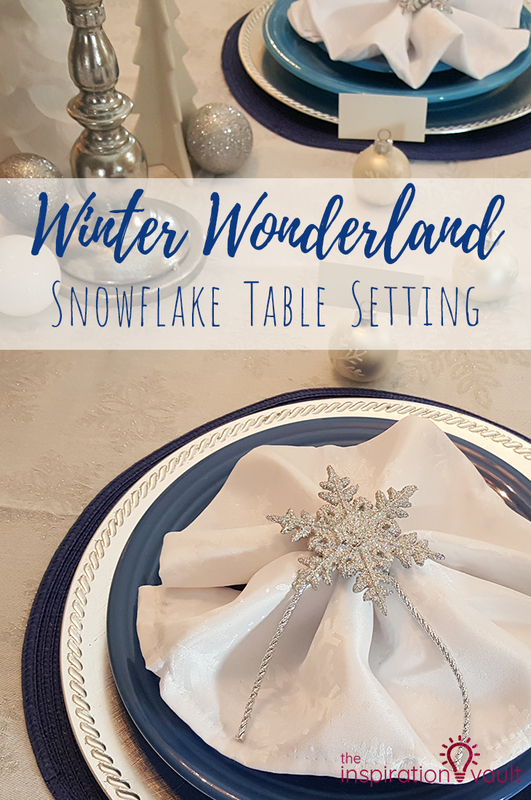 Since I’ve been slowly converting my dining room into a winter wonderland, it was only fitting that I feature a Winter Wonderland Snowflake Table Setting. 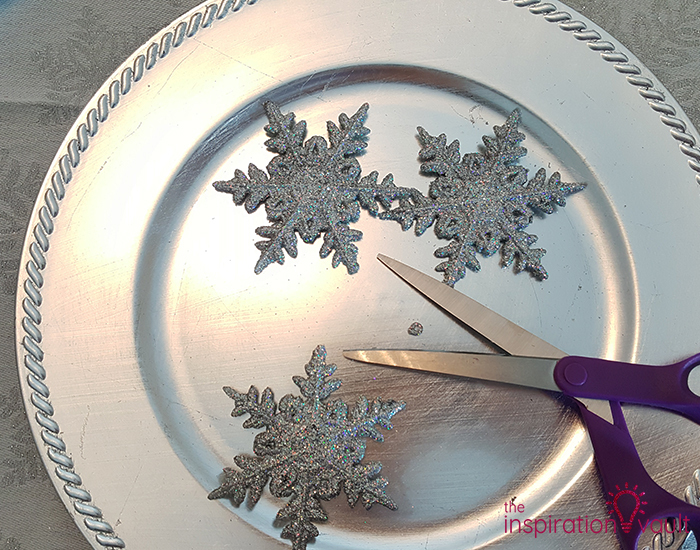 While I don’t have a major tutorial for you, I couldn’t let you leave empty-handed, so I made a mini tutorial where you can see how super easy it is to make pretty napkin rings with those glittered snowflake ornaments. I would love to say that my family eats every meal in our dining room at our huge table, but that would be a lie, lol. 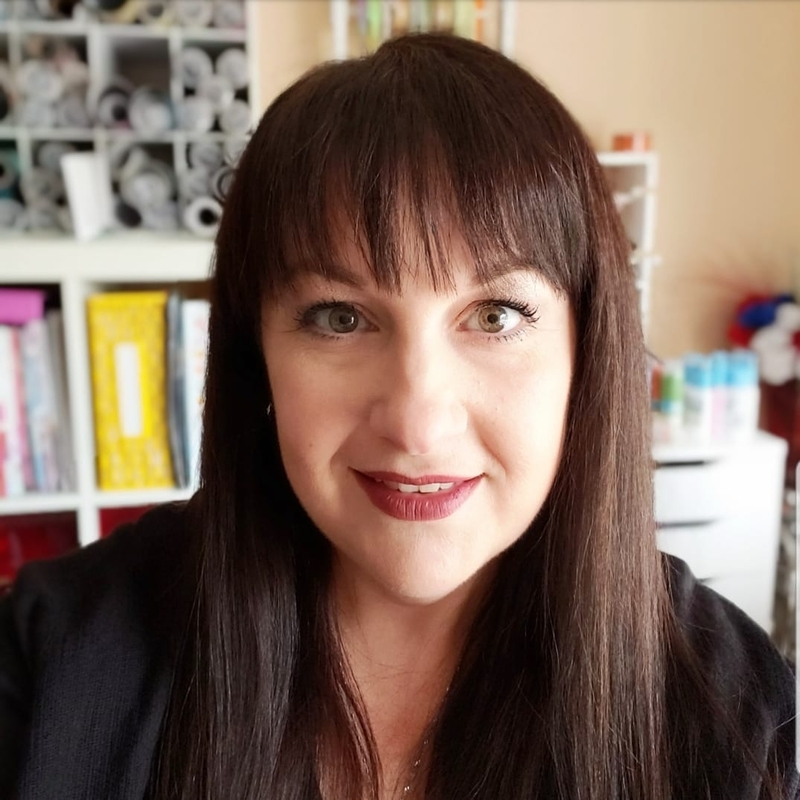 We my kids usually eat at a round kitchen table in the family room, the kind that has a “wash at least once a week” tablecloth and hard floors underneath. Because kids. We do eat in the dining room for special occasions or sometimes for Sunday family dinners. But I digress. Regardless of where we eat, the very first room anyone sees when they walk into my house is my dining room, so I like to keep it nicely decorated. 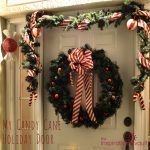 Normally my dining room is decorated with warm, earthy tones and “world” inspired art and decor, so transforming this room into a Winter Wonderland was quite a feat. I started with the table since I already had a lot of the materials and decor on hand. 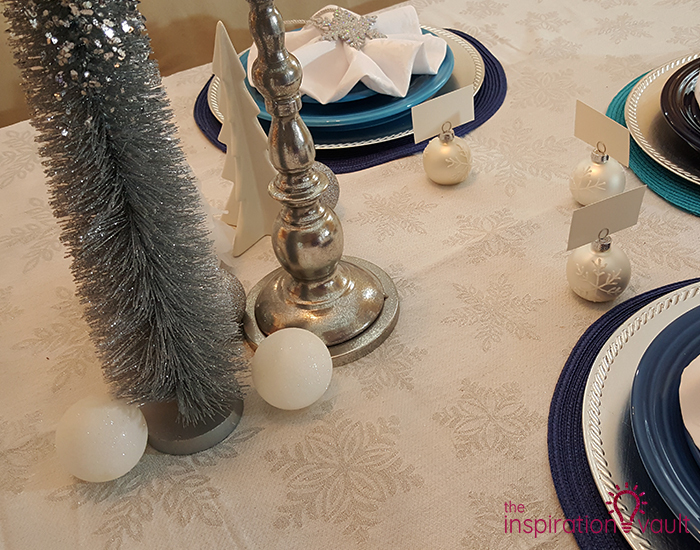 I found the snowflake tablecloth at HomeGoods for only $20 and I love it because it’s cotton and not polyester. Sure polyester is easier to clean (see above round table description), but I really don’t like how they feel. 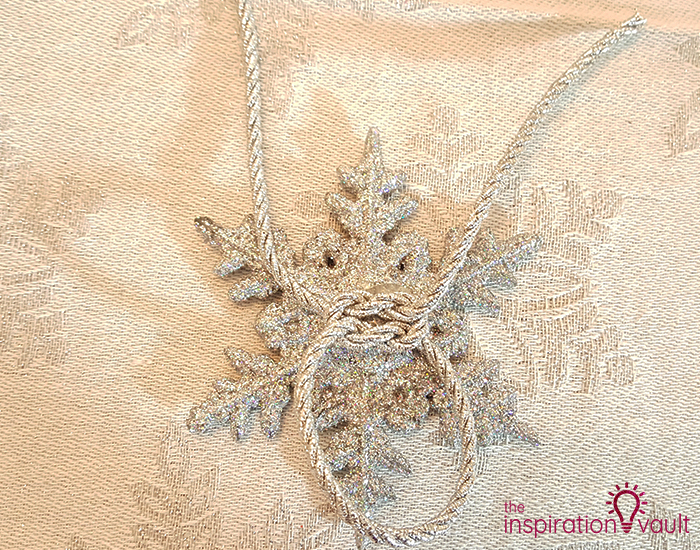 This snowflake tablecloth also looks great with the rest of the room. 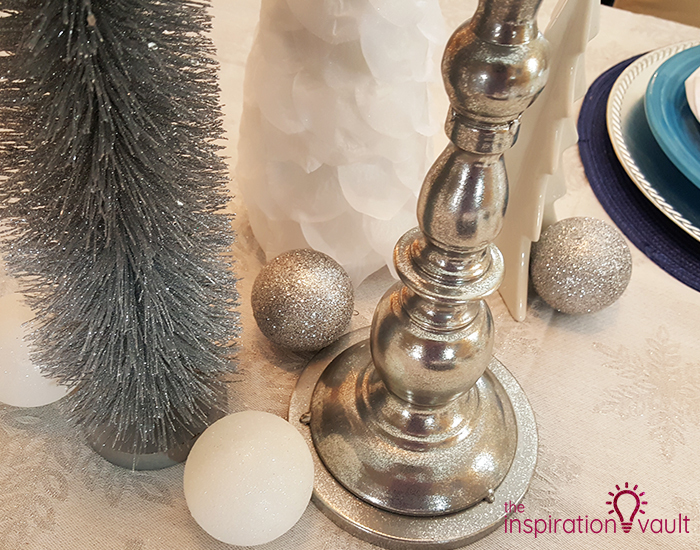 Truth bomb again, I haven’t made a firm decision on which of the pretty trees and other decor I’ve been making and buying will go on the table and which will go on the sideboard, so for now, I have selected a pretty, silver brush tree and a white ceramic tree I found at Hobby Lobby. 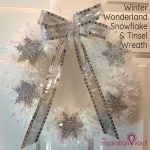 I also added the White Flower Petal Cone Tree I made for day 5 and some white and silver glittery ornaments. I also found the silver candle pillars at Hobby Lobby. You’ll be able to see my final decisions when I show you my white tree (and the whole room) in a couple of days. The one thing that is firm-ish is the actual place setting. I found these adorable snowflake ornament place card holders at Hobby Lobby. 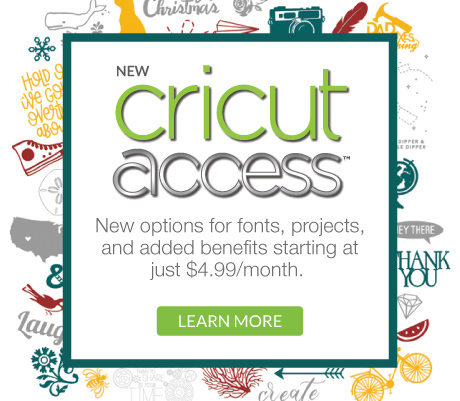 I love them, but do we need them? Probably not, but I got them on clearance for $2.50. Maybe for fun on Christmas, I’ll write in ridiculous names instead of our real ones. That brings us to the blue plates. 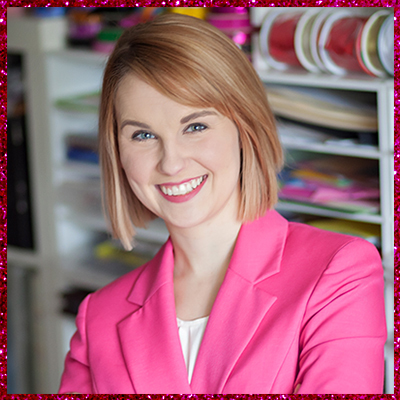 Are you wondering why they’re all different shades of blue? Well, in case you’re not familiar with the design, these are Fiestaware plates. 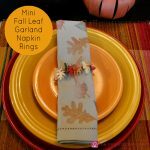 I have 14 place settings, all in different colors of the rainbow (like the placemats) plus other serving pieces, all in different colors. That darker blue is actually a cobalt blue, it just looks darker in the photos. And that brings us to the napkins. I found these poly snowflake napkins at Hobby Lobby. (Everything was 50% off, promise!) I folded them into a simple accordion and then fanned them out to make a sort of snowflake (maybe, if you squint) on the plate. 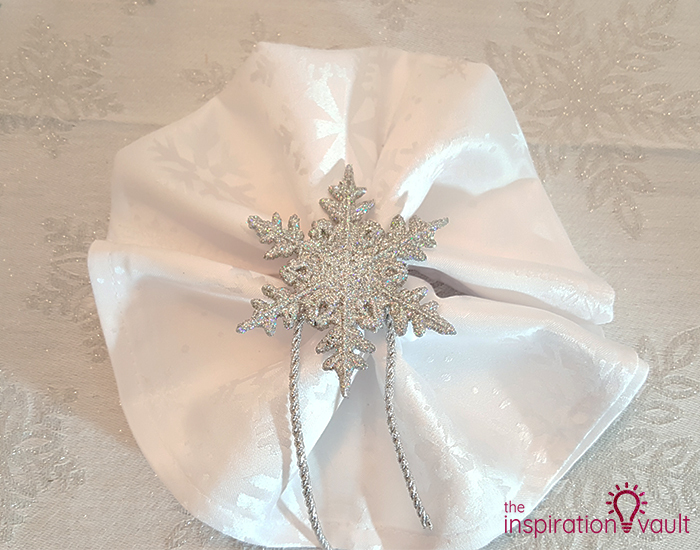 I made the simple snowflake napkin rings in a matter of minutes and you can, too! 1. 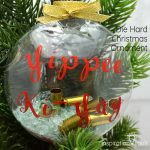 Cut the little circle hangers off of the ornaments. 2. 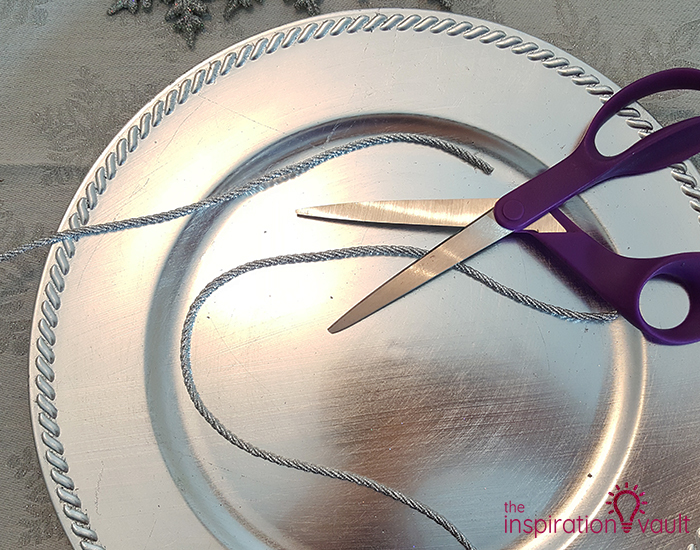 Cut 12 inches of cord for each napkin ring. 3. 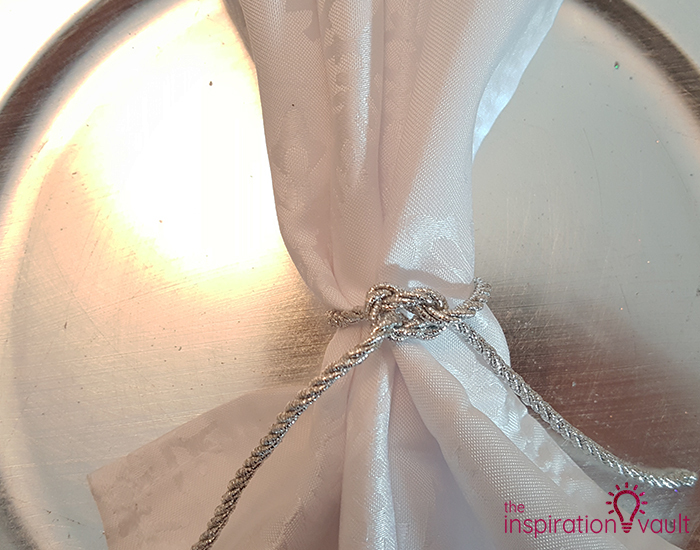 Fold the napkin in half and then fold it in an accordion. 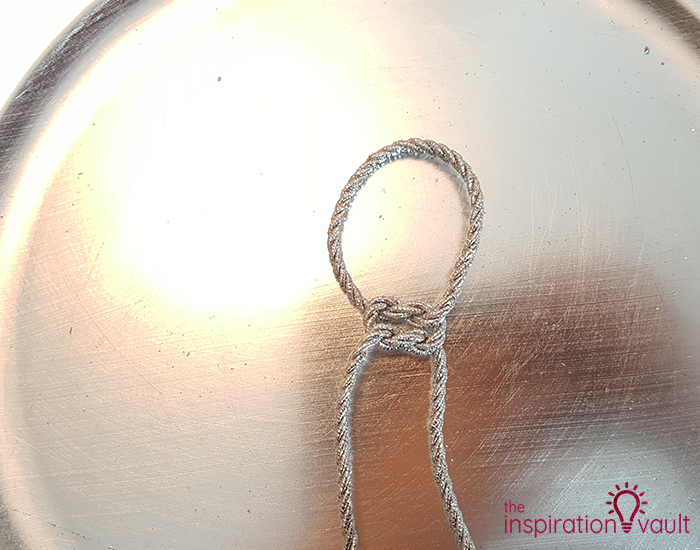 Wrap the cord around the napkin, back to front and tie it into a double knot. 4. 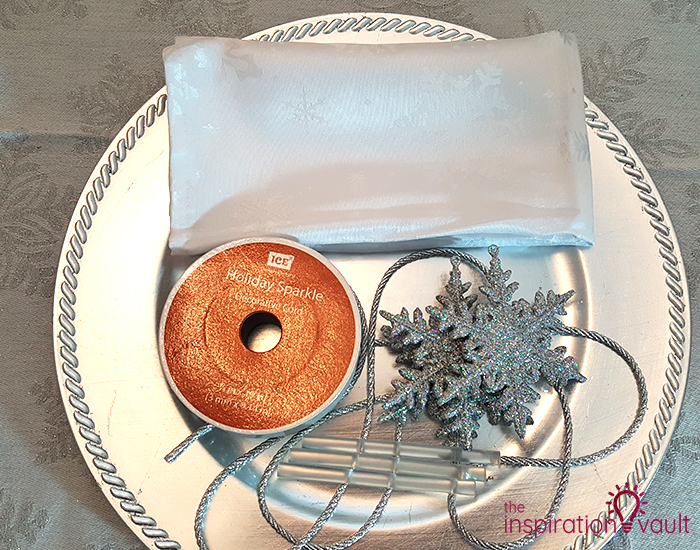 Slide the cord off of the napkin and lay it down flat. That’s it! 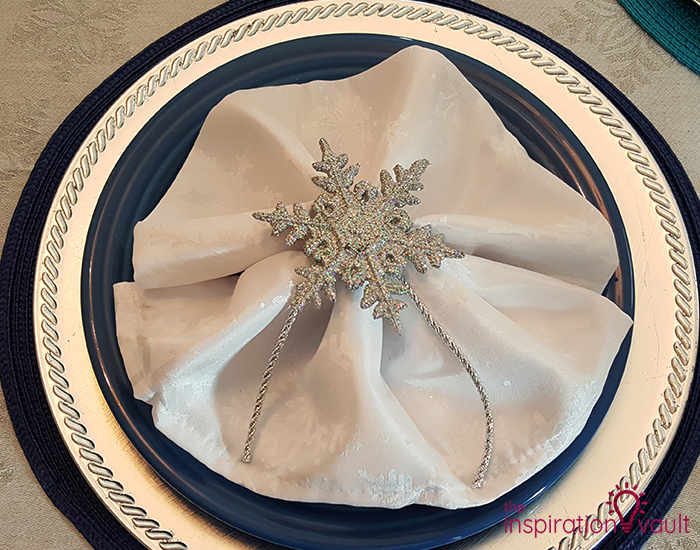 Of course, you can recreate this napkin ring with any color combo of cording and snowflake ornament. 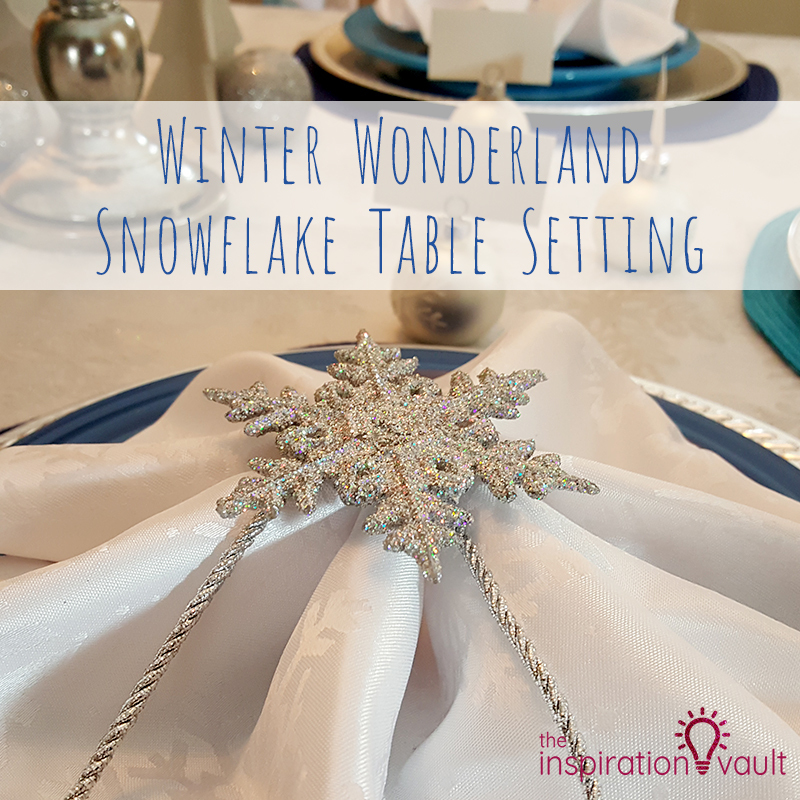 But if you want to recreate your own Winter Wonderland Snowflake Table Setting, you now have all of the details you need. 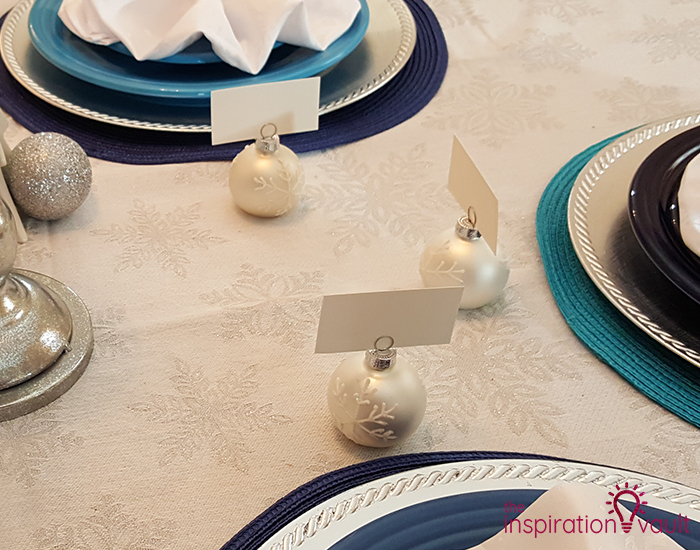 I can’t wait to show you the whole room and the whole table with my tree reveal. Everything looks so pretty together. Such a pretty setting. Guests would really be impressed! Thank you for sharing. 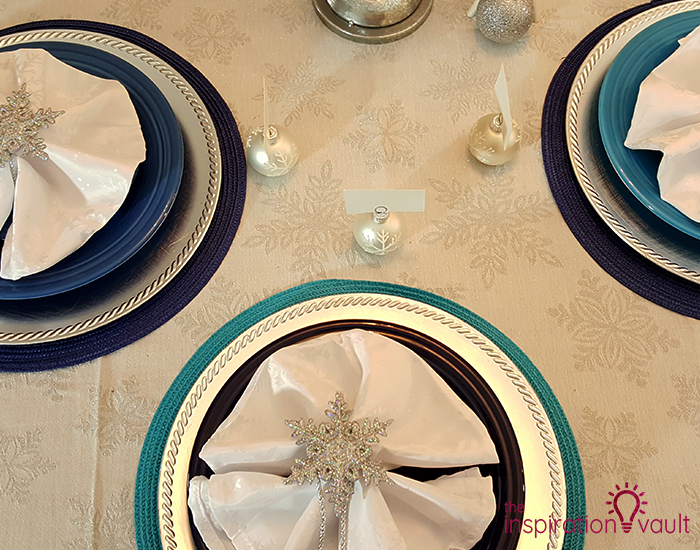 Very pretty table setting. We don’t get fancy here we eat off of paper plates.